Objective: In this study, antiurolithiasic and hepatoprotective effects of Ferula assa-foetida oleo-gum-resin (asafoetida) were evaluated in Wistar rats. Methods: Negative control rats were provided with ethylene glycol (EG, 1%) in drinking water for 28 days. In treatment group, asafoetida was used simultaneously once daily for 28 days at the dose of 25 mg/kg. 8-h urine was collected from experimental animals at the end of the experiment. Urine level of creatinine, uric acid, urea, K+, Ca2+, Mg2+, Na+, phosphorus, and serum level of transaminase (alanine aminotransferase (ALT) and aspartate aminotransferase (AST), alkaline phosphatase (ALP), and lactate dehydrogenase (LDH) were evaluated. In addition, histopathological changes in kidney and liver were stained in hematoxylin and eosin. Results: Asafoetida showed a significant effect on urine volume; water intake and urinary ionic parameters were altered by EG, which elevated the calcium and inorganic phosphate; and asafoetida significantly reduced the elevated levels of these ions. In addition, asafoetida significantly elevated the urinary concentration of magnesium. ALT, AST, LDH, and ALP were elevated by EG and asafoetida significantly reduced the elevated levels of these parameters. The histological findings also showed improvement after treatment with the asafoetida. Conclusion: The presented data indicate that administration of asafoetida prevented the growth of urinary stones and also have hepatoprotective effect in experimental EG nephrolithiasis in Wistar rats. Kidney stone disease is a multifactorial disorder resulting from the combined influence of epidemiological, biochemical, and genetic risk factors. It occurs both in men and women, but the risk is generally higher in men and is becoming more common in young women. Various therapies including thiazide diuretics and alkali citrate are being used in an attempt to prevent recurrence, but scientific evidence for their efficacy is less convincing. Surgical operation, lithotripsy, and local calculus disruption using high-power laser are widely used to remove the calculi. However, these procedures are expensive and recurrence is also common. In the traditional systems of medicine, medicinal plants are important sources of safe chemical substances with potential therapeutic effects. The World Health Organization has estimated that over 75% of the world's population still relies on plant-derived medicines, usually obtained from the traditional healers. These plant products are reported to be effective in decreasing the recurrence rate of renal calculi with no side effects. Plants of the genus Ferula, family Apiaceae, include about 130 species distributed throughout Central Asia and Mediterranean area.Ferula assa-foetida L. grows wildly in the central area of Iran that pharmacologically important part of this plant and several other species of Ferula is an oleo-gum-resin (asafoetida) obtained from incisions in the stem and/or roots of these plants. In Iranian folk medicine, asafoetida is used as a diuretic, antispasmodic, carminative, and analgesic agent. Recent pharmacological and biological studies have also shown several pharmacological activities such as antioxidant, antileishmanial, cancer chemopreventive, anticonvulsant  antidiabetic, antispasmodic, hypotensive, and antinociceptive  for asafoetida. Phytochemistry of asafoetida showed that gum fraction contains the glucuronic acid, galactose, arabinose, and rhamnose and its resin consists of umbelliferone, ferulic acid and its esters, coumarins, sesquiterpene coumarins, and other terpenoids. Despite the fact that in Iranian folk medicine, asafoetida has been considered as a diuretic agent, to our knowledge, there is no comprehensive study on its effects on the renal function except our previous work. Although many interesting results have been obtained from their potential therapeutic usefulness, no studies evaluating antinephrolithiasic effect of this herb have been reported yet. In this work, prophylactic effects of asafoetida were evaluated on nephrolithiasis induced by administration of ethylene glycol (EG) in rats. F. assa-foetida oleo-gum-resin was collected during the summer from the Tabas region (Yazd Province, Iran), and the plant species was botanically identified by Dr. Abbas Zarezadeh in Yazd Agricultural Research Center. The dried powder of asafoetida was soaked in distilled water overnight at room temperature and the yielded suspension was used orally. Concentrations and dosages of the extract were expressed as crude amount of the dried oleo-gum-resin used in preparing the stock solution. Male albino rats (250–300 g) with 6–8 weeks old and bred in animal house of Medical School of Shahid Sadoughi University of Medical Sciences were selected. Animals were housed at controlled temperature (22°C ± 2°C) with a 12-h light/dark cycle and with standard laboratory chow and tap water ad libitum. The experiments reported in this study were carried out in accordance with the ethical guidelines of Shahid Sadoughi University of Medical Sciences for the investigation of experimental animals. Animals were divided into three groups containing six animals in each group. Group I served as normal control and received regular rat food and drinking water ad libitum. Group II served as lithiatic control and received EG 1% in drinking water which was fed for induction of renal calculi till the 28th day. Group III received EG 1% in drinking water and also asafoetida (25 mg/kg) by oral route using gastric tube till the 28th day. On day 28, animals of all groups were kept in metabolic cages and urine samples were collected for 8 h and analyzed for calcium, magnesium, sodium, potassium, inorganic phosphate, pH, creatinine, urea, and uric acid using standard methods. Urinary output volumes and water intake of all groups were also noted. Blood was collected from orbital sinus of rats. Serum was prepared by centrifugation (3000 rpm, 20 min) and stored frozen until biochemical assay. Lactate dehydrogenase (LDH), aspartate aminotransferase (AST), alanine aminotransferase (ALT), and alkaline phosphatase (ALP) were determined using the suitable kits and according to the manufacturer's instructions. For histopathological studies, liver and kidney tissues were collected immediately in 10% neutral buffered formalin. The tissues were processed by routine histological methods and embedded in paraffin blocks. The sections were cut by a rotary microtome and subsequently stained with Ehlrich's hematoxylin and eosin. The histological sections were studied under Olympus light microscopy (Olympus, Japan) to evaluate the histopathological changes. where A Control is the absorbance of a DPPH solution without asafoetida, A Extract is the absorbance of the tested extract, which is equal to the absorbance of the asafoetida plus the DPPH (20 mg/L) minus the blank extract absorbance. The samples were run in triplicate and the mean value of three of them was recorded. The percentage inhibition was plotted against the sample concentration in order to calculate the IC50 values, which is the concentration (μg/ml) of asafoetida that causes 50% loss of DPPH activity. The results were expressed as mean ± standard deviation. GraphPad Prism 5 Software (Inc., San Diego, CA) was used for data analysis. Statistical analysis was performed by ANOVA test for multiple comparisons followed by Tukey's test and P < 0.05 was considered statistically significant. The effect of single asafoetida dose on urine biochemical parameters is presented in [Table 1]. Asafoetida enhanced the excretion of the total amount of the Na + as compared with lithiasis control group. Urea, creatinine, uric acid, calcium, and phosphorus concentration in asafoetida-treated animals were also significantly decreased as compared to lithiasis control group. Urinary magnesium was significantly diminished in EG-induced urolithic rats. The asafoetida treatment restored the magnesium excretion compared to EG treatment group. There was no significant difference between the pH values of urine in different groups. Serum biochemical parameters (AST, ALT, ALP, and LDH) are presented in [Table 2]. Our results showed that AST, ALT, ALP, and LDH significantly decreased in treated animals with asafoetida compare to lithiatic control group. Determination of the first 8-h urine output revealed that asafoetida (25 mg/kg) statistically increased the urine volume as compared to lithiatic control group (P < 0.01) [Figure 1]. 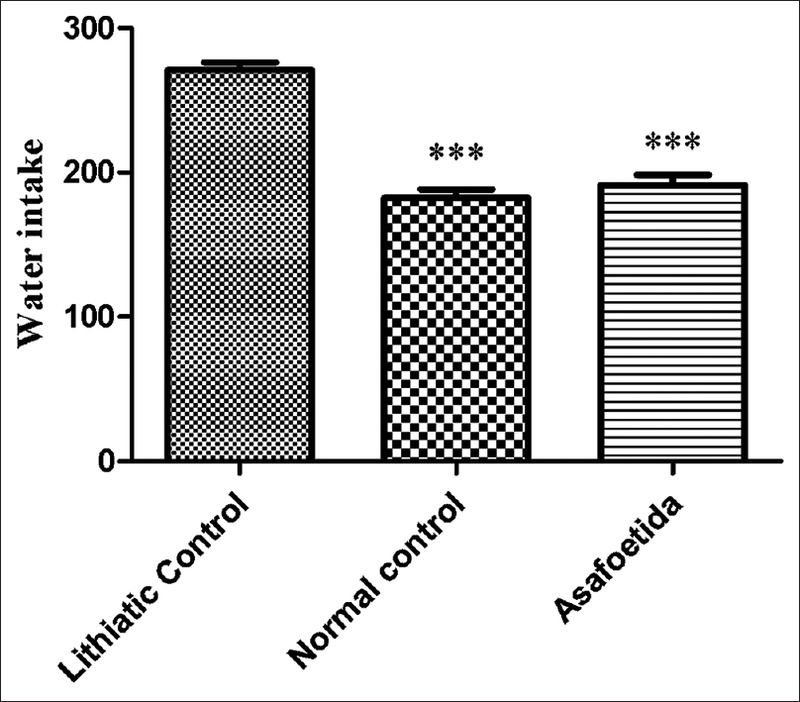 The values reported in [Figure 2] showed that water intake in treated group with asafoetida significantly decreases compare to lithiatic control group. Histological examinations of the kidneys from animals in the control group revealed normal cortical and modularly tubules with no sign of crystallization or other abnormalities in tissue [Figure 3] and [Figure 4]a. In EG-treated group, renal lesions included degeneration, epithelial damage; leukocyte reaction and necrosis were found. Many crystals deposits (arrows) with secondary tubular dilatation were detected in the proximal tubules, loops of Henle, distal tubules, collecting ducts, and even calyxes [Figure 3] and [Figure 4]b. In extract (25 mg/kg)-treated group, renal architecture resembled the control group. Normal tubular and collecting ducts were seen and crystals deposition and secondary tubular dilatation were decreased compared with EG-treated group. A few thin and tiny crystals were found in extract-treated group [Figure 3] and [Figure 4]c.
Histological examinations of liver tissue under light microscope revealed that in the control group, hepatic architecture was normal. Normal cords of hepatocytes with prominent nucleus were observed. Central vein and portal tracts with no sign of inflammation or necrosis were seen [Figure 5]a. Histopathology changes in the liver were observed in EG-treated group. Distortion in the arrangement of cell cords around the central vein, leukocyte infiltration around central vein, and congestion of hepatic sinusoids were observed. Degeneration and necrosis of hepatocytes and accumulations of eosinophilic granular to globular material resembling crystals deposits in the liver have been observed [Figure 5]b. In the sections of the extract (25 mg/kg)-treated group, histopathological changes were not observed and mild congestion of hepatic sinusoids and necrosis were seen [Figure 5]c.
In this work, our results showed that the IC50 of antioxidant activity of asafoetida was 109 μg/ml. The annual incidence and prevalence of urinary tract stones is increasing, while the age of onset of this disorder is decreasing, probably due to the change in dietary lifestyle, habits, diets, hypertension, and obesity. It has been indicated that chronic administration of EG, which is oxidized to oxalic acid by nonspecific dehydrogenase, causes increased renal retention and excretion of oxalate and the formation of renal calculi composed mainly of calcium oxalate (CaOx). Male rats were selected to induce urolithiasis because the urinary system of male rats resembles that of humans, and earlier studies have shown that kidney stone formation in female rats was significantly less than male rats. Despite the recent advances in the treatment of kidney stones with modern techniques such as extracorporeal shockwave lithotripsy, high cost, several adverse effects, and the recurrence of stones limit their usefulness. Herbal medicines have shown protective effects in different in vitro and in vivo models of urolithiasis, perhaps due to multiple constituents acting through different pathways., In the present study, protective effects of asafoetida were evaluated against EG-induced nephrolithiasis and hepatotoxicity in male Wistar rats. Urinary chemistry is one of the important factors in determining the type of crystal formed and the nature of macromolecules included on the surface of the crystals. In this study, there is no significant difference in pH. Although decreased levels of urinary pH have been reported in some studies, in the present study, the pH of urine did not significantly change over a period of 28 days of EG administration, which is in accordance with the results of Green et al., who concluded that metabolic acidosis does not develop in conventional EG treatments, but may result from renal insufficiency induced by oxalate load. Normal urine contains many inorganic and organic inhibitors of crystallization. Magnesium complexes with oxalate and reduce the super saturation of CaOx by reducing the saturation of CaOx and as a consequence reduces the growth and nucleation rate of CaOx crystals. In this study, urinary magnesium was significantly diminished in EG-induced urolithic rats. The asafoetida treatment restored the magnesium excretion compared to EG treatment group. We also observed an increase in urinary phosphorus excretion in EG-induced urolithic rats. Increased excretion of phosphorus has been reported in stone formers  and exertion of phosphorus along seems to provide an environment appropriate for stone formation by forming calcium phosphate crystals. In this study, the increase in urinary uric acid excretion was observed in urolithic control rats. Uric acid interferes with CaOx solubility and it binds and reduces the inhibitory activity of glycosaminoglycans. The predominance of uric acid crystals in CaOx stones and the observation that uric acid-binding proteins are capable of binding to CaOx and modulate its crystallization also suggest its primary role in stone formation. Increase in calcium levels in the renal tissue of urolithic control rats was observed and asafoetida treatment suppresses this increase in intracellular calcium. The exact reason of this effect is not clear; however, it might be due to the increased bioavailability of nitric oxide (NO) which in turns activates cyclic guanosine monophosphate (cGMP) that controls the increase in intracellular calcium levels. Previous studies reported that NO donors have the capacity to control the intracellular rise in calcium levels. The antiurolithiatic effect was further confirmed by kidney histopathological studies. Microscopic examination of kidney sections derived from EG-induced urolithic rats showed polymorphic irregular crystal deposits inside the tubules which cause dilation of the proximal tubules along with interstitial inflammation that might be attributed to oxalate. Cotreatment with the asafoetida decreased the number and size of crystal deposits in different parts of the renal tubules and prevented damages to the tubules and calyxes. Furthermore, renal epithelial cells had more tubular dilatation and damage that is showed by large spaces in the tissue. The nephroprotective effects of asafoetida in the EG-induced urolithiasis model could be through maintaining balance between stone promoters and inhibitors, reducing deposition of CaOx crystals from the kidney and preventing the EG-induced lipid peroxidation. Probably, antioxidant constituents of asafoetida restore the renal antioxidant enzyme and prevent renal cell injury. Antioxidant and anti-inflammatory properties of this oleo-gum-resin have been shown in our previous study. In this study, hepatic function has been monitored by the evaluation of the serum level of ALT, AST, ALP, and LDH. The AST and ALT activities are known as cytosolic marker enzymes reflecting hepatocellular necrosis as they are released into the blood after cell membrane damage. Compared with normal rats, lithiasis rats showed more activities of serum AST and ALT. Usually, about 80% of AST is found in the mitochondria whereas ALT is a purely cytosolic enzyme. The AST is also found in a large number of tissues, such as heart, lung, skeletal muscle, and kidney, whereas ALT is primarily limited to liver. A rise in plasma ALP levels is usually a characteristic finding in obstructive hepatobiliary disease as found in cholestasis liver disease. In this view, the reduction of AST, ALT, LDH, and ALP levels with the asafoetida is a stabilization indication of plasma membrane as well as repair of hepatic tissue damage. The results of histopathological studies provided supportive evidence for biochemical analysis. Histology of liver section of normal control animal exhibits normal hepatic cells each with well-defined cytoplasm, prominent nucleus and nucleolus, and well-brought central vein. 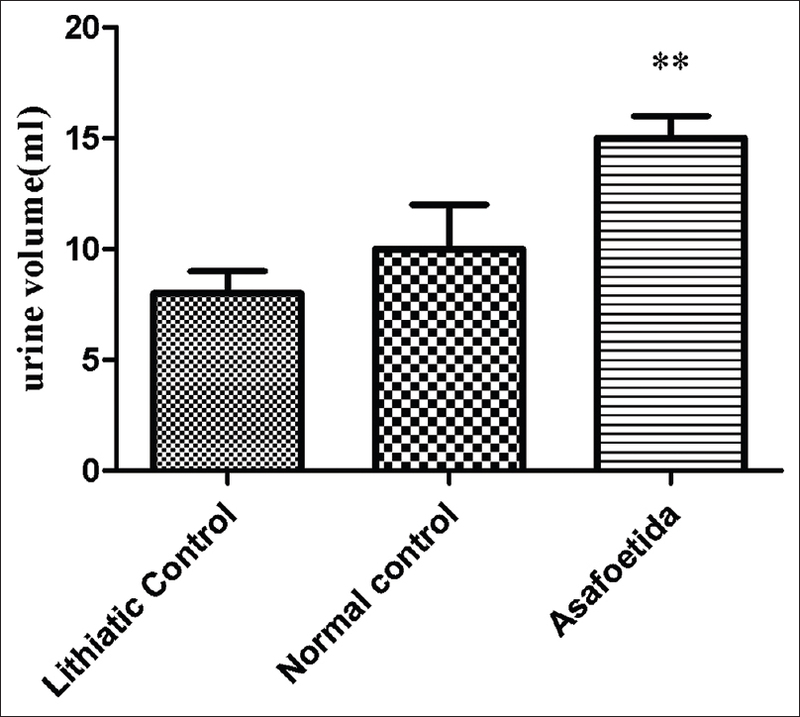 Pretreatment with asafoetida at the dose of 25 mg/kg has shown a potential hepatoprotective activity and reduced the degenerative changes in liver [Figure 5]c. The result thus obtained is in the agreement with the work carried out by Dandagi et al., who reported that the hepatoprotective activity of F. assa-foetida on CCl4 induced damage in rats. Taken together, it has been suggested that asafoetida, a wide spectrum of therapeutic potentials, could be useful as either alternative or an adjunctive therapy in the management of kidney stones. Antioxidant activity seems to be an important factor in mediating the antilithiatic effects. However, further studies are required to determine the exact mechanisms by which asafoetida prevents EG-induced nephrolithiasis. The authors give thanks to all people who have assisted the experimental procedure and to the research deputy of Yazd Shahid Sadughi Medical University as the sponsor of this research. Bashir S, Gilani AH. Antiurolithic effect of Bergenia ligulata rhizome: An explanation of the underlying mechanisms. J Ethnopharmacol 2009;122:106-16. Prasad K, Sujatha D, Bharathi K. Herbal drugs in urolithiasis-a review. Pharmacogn Rev 2007;1:175. Houghton PJ. The role of plants in traditional medicine and current therapy. J Altern Complement Med 1995;1:131-43. Makasana A, Ranpariya V, Desai D, Mendpara J, Parekh V. Evaluation for the anti-urolithiatic activity of Launaea procumbens against ethylene glycol-induced renal calculi in rats. Toxicol Rep 2014;1:46-52. Bagheri SM, Sahebkar A, Gohari AR, Saeidnia S, Malmir M, Iranshahi M, et al. Evaluation of cytotoxicity and anticonvulsant activity of some iranian medicinal Ferula species. Pharm Biol 2010;48:242-6. Iranshahy M, Iranshahi M. Traditional uses, phytochemistry and pharmacology of asafoetida (Ferula assa-foetida oleo-gum-resin)-a review. J Ethnopharmacol 2011;134:1-0. Azizian H, Rezvani ME, Esmaeilidehaj M, Bagheri SM. Anti-obesity, fat lowering and liver steatosis protective effects of Ferula asafoetida gum in Type 2 diabetic rats: Possible involvement of leptin. Iran J Diabetes Obes 2012;4:120-6. Dehpour AA, Ebrahimzadeh MA, Fazel NS, Mohammad NS. Antioxidant activity of the methanol extract of Ferula assafoetida and its essential oil composition. Grasas Aceites 2009;60:405-12. Bafghi AF, Bagheri SM, Hejazian SH. Antileishmanial activity of Ferula assa-foetida oleo gum resin against Leishmania major: An in vitro study. J Ayurveda Integr Med 2014;5:223. Saleem M, Alam A, Sultana S. Asafoetida inhibits early events of carcinogenesis: A chemopreventive study. Life Sci 2001;68:1913-21. Bagheri SM, Rezvani ME, Vahidi AR, Esmaili M. Anticonvulsant effect of Ferula assa-foetida oleo gum resin on chemical and amygdala-kindled rats. N Am J Med Sci 2014;6:408-12. Abu-Zaiton AS. Anti-diabetic activity of Ferula assafoetida extract in normal and alloxan-induced diabetic rats. Pak J Biol Sci 2010;13:97-100. Bagheri S, Hejazian S, Dashti RM. The relaxant effect of seed fs essential oil and oleo-gum-resin of Ferula assa-foetida on isolated rat's ileum. Ann Med Health Sci Res 2015;4:238-41. Fatehi M, Farifteh F, Fatehi-Hassanabad Z. Antispasmodic and hypotensive effects of Ferula asafoetida gum extract. J Ethnopharmacol 2004;91:321-4. Bagheri S, Dashti RM, Morshedi A. Antinociceptive effect of Ferula assa-foetida oleo-gum-resin in mice. Res Pharm Sci 2014;9:207. Bagheri SM, Mohammadsadeghi H, Dashti-R MH, Mousavian SM, Aghaei ZA. Effect of Ferula assa-foetida oleo-gum-resin on renal function in normal wistar rats. Indian J Nephrol 2016;26:419-22. Mandavia DR, Patel MK, Patel JC, Anovadiya AP, Baxi SN, Tripathi CR, et al. Anti-urolithiatic effect of ethanolic extract of Pedalium murex linn. Fruits on ethylene glycol-induced renal calculi. Urol J 2013;10:946-52. Bagheri SM, Hedesh ST, Mirjalili A, Dashti-R MH. Evaluation of anti-inflammatory and some possible mechanisms of antinociceptive effect of Ferula assa foetida oleo gum resin. J Evid Based Complementary Altern Med 2016;21:271-6. Frassetto L, Kohlstadt I. Treatment and prevention of kidney stones: An update. Am Fam Phys 2011;84:1234. Ghaeni FA, Amin B, Hariri AT, Meybodi NT, Hosseinzadeh H. Antilithiatic effects of crocin on ethylene glycol-induced lithiasis in rats. Urolithiasis 2014;42:549-58. Karadi RV, Gadge NB, Alagawadi KR, Savadi RV. Effect of Moringa oleifera lam. Root-wood on ethylene glycol induced urolithiasis in rats. J Ethnopharmacol 2006;105:306-11. Gandhi M, Aggarwal M, Puri S, Singla SK. Prophylactic effect of coconut water (Cocos nucifera L.) on ethylene glycol induced nephrocalcinosis in male wistar rat. Int Braz J Urol 2013;39:108-17. Tayefi-Nasrabadi H, Sadigh-Eteghad S, Aghdam Z. The effects of the hydroalcohol extract of Rosa canina L. Fruit on experimentally nephrolithiasic wistar rats. Phytother Res 2012;26:78-85. Green ML, Hatch M, Freel RW. Ethylene glycol induces hyperoxaluria without metabolic acidosis in rats. Am J Physiol Renal Physiol 2005;289:F536-43. Soundararajan P, Mahesh R, Ramesh T, Begum VH. Effect of Aerva lanata on calcium oxalate urolithiasis in rats. Indian J Exp Biol 2006;44:981-6. Pragasam V, Kalaiselvi P, Sumitra K, Srinivasan S, Varalakshmi P. Counteraction of oxalate induced nitrosative stress by supplementation of l-arginine, a potent antilithic agent. Clin Chim Acta 2005;354:159-66. Latha RM, Geetha T, Varalakshmi P. Effect of Vernonia cinerea less flower extract in adjuvant-induced arthritis. Gen Pharm 1998;31:601-6. Al-Mamary M, Al-Habori M, Al-Aghbari AM, Baker MM. Investigation into the toxicological effects of Catha edulis leaves: A short term study in animals. Phytother Res 2002;16:127-32. Dandagi PM, Patil MB, Mastiholimath VS, Gadad AP, Dhumansure RH. Development and evaluation of hepatoprotective polyherbal formulation containing some indigenous medicinal plants. Indian J Pharm Sci 2008;70:265-8.